Increasing penetration of video surveillance technologies in Kuwait as a result of rising infrastructural development coupled with increasing IT spending has driven the market for Kuwait video surveillance systems. The increasing awareness about video surveillance systems, primarily IP video surveillance systems is also assisting the growth of overall market. Kuwait is exhibiting increase in construction activities and expected to foresee construction of three new cities. On account of rising security concerns, primarily terrorist threats, large deployment of video surveillance security systems is expected over the next six years. According to 6Wresearch, Kuwait's Video Surveillance Systems market is estimated to register growth of 5% in 2015. In Kuwait market, IP based video surveillance systems have captured majority of the market share in 2014 and would lead through the forecast period; however, share of analog video surveillance is expected to decline in the coming years. Additionally, Kuwait video surveillance market is expected to witness growing demand for video analytics software. Amongst all the applications, government & transportation has generated largest revenue share of the market pie in the country and would maintain its market leadership through the forecast period as well. The report thoroughly covers the video surveillance market by types, components, by verticals, and regions. The report provides unbiased and detailed analysis of the on-going trends, opportunities/ high growth areas, market drivers, which would help the stakeholders to decide and align their market strategies according to the current and future market dynamics. •	Historical data of Global Video Surveillance Market for the Period 2010-2014. •	Market Size & Forecast of Global Video Surveillance Market until 2021. •	Historical data of Kuwait Video Surveillance Market for the Period 2010-2014. •	Market Size & Forecast of Kuwait Video Surveillance Market until 2021. •	Historical data of Kuwait Analog Video Surveillance Market for the Period 2010-2014. •	Market Size & Forecast of Kuwait Analog Video Surveillance Market until 2021. •	Historical data of Kuwait IP Video Surveillance Market for the Period 2010-2014. •	Market Size & Forecast of Kuwait IP Video Surveillance Market until 2021. •	Historical data of Kuwait Video Surveillance Application Market for the Period 2010-2014. •	Market Size & Forecast of Kuwait Video Surveillance Application Market until 2021. •	Historical data of Kuwait Video Surveillance Regional Market for the Period 2010-2014. 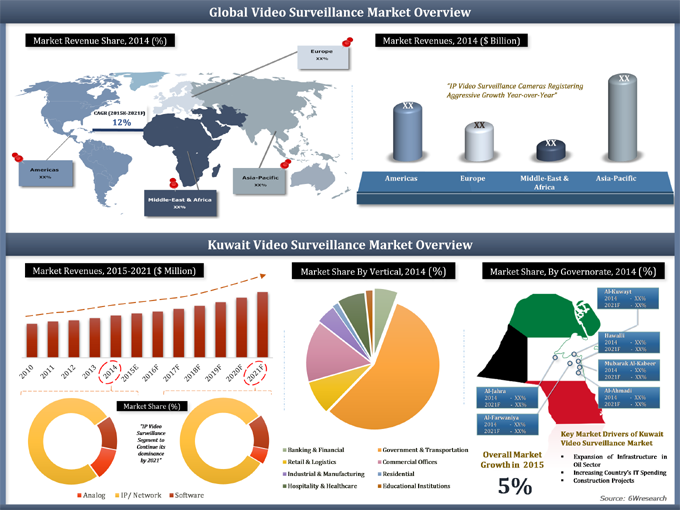 •	Market Size & Forecast of Kuwait Video Surveillance Regional Market until 2021. 13.3	Hangzhou Hikvision Digital Technology Co. Ltd.
13.6	Samsung Techwin Co. Ltd.
Kuwait is one of the prime growing economies amongst GCC countries. On account of growing construction market along with rising security concerns, Kuwait witnessed increase in deployment of various electronic security systems. Additionally, in electronic security systems market, video surveillance systems pegged majority of the demand. In Kuwait's video surveillance market IP/ Network video surveillance systems are recording higher growth than analog video surveillance systems. Apart from growing demand for IP video surveillance systems, Kuwait also exhibited significant growth in video analytics software, owing to rising security concerns in the country primarily due to terrorist threats. Majority of the demand for next generation security solutions was majorly derived from government & transportation application sector. Furthermore, Al-Kuwayt governorate region held largest market share, followed by Al-Farwaniya and others. The major companies in Kuwait's video surveillance market include- Axis Communications, Bosch Security Systems, Hikvision, Honeywell, Pelco by Schneider Electric and Samsung Techwin.